The presumed benefits to infants of breastfeeding have been determined on the basis of observational studies, which can find "associations," from which only "inferences" can be drawn. This is acknowledged by Surgeon General Regina Benjamin, in her "Call to Action to Support Breastfeeding 2011" (p. 33).1 Observational studies conducted in Florida would find that sunshine is "associated" with a high death rate, and people could overlook the unusually advanced ages of many Floridians when finding this correlation of death rates with sunshine. In a similar way, many people overlook the fact that bottle-feeding mothers are unusually likely to be of low income1and to smoke.2 Conditions related to low income and smoking are known to lead to all of the adverse health outcomes that many people attribute to bottle feeding.3. One of the disorders alleged to be reduced by breastfeeding: See what actually happened. Looking at this chart, be aware that, after many low years, U.S. breastfeeding rates increased rapidly beginning in 1972.1 Then observe that, for each age group in these charts, obesity levels were not increasing significantly until the very first period in which part of that group's infancies occurred after 1972. 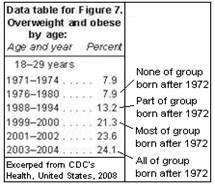 Obesity also increased among older Americans during these years, but it increased 125% more among the 6-19 age groups than among the 35-74 age groups. And the older group had a known reason for its increasing obesity, which was the great decline in physically-active jobs in agriculture and manufacturing during the last half century.5 That decline would not have substantially affected U.S. children. Another disorder alleged to be reduced by breastfeeding: instead it more than tripled. The relationship between breastfeeding and childhood cancer in general is also of interest. The Western U.S. is the region lowest in known carcinogens, and therefore is the best region for seeing effects of a single source of those toxins. There, higher and lower breastfeeding percentages in 2001-2003 were very good at predicting childhood cancer rates in 2005-2009 -- see chart on left. 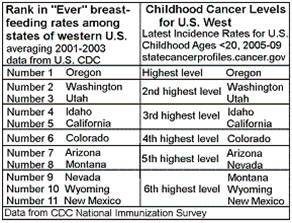 The relationship is similar for the rest of the U.S. states – see www.breastfeeding-and-cancer.info. Of 10 environmental chemicals that have been specifically identified as justifying research as possible causes of autism (Landrigan et al. ), and of various toxins seen as causing harm to immunity development, most of them have been found in breast milk, some in high concentrations (dioxins and PBDEs, notably). Those two are known to have testosterone-reducing effects, which helps explain why autism and ADHD are found especially in males, since testosterone is important to neurological development. Blacks breastfeed at about half as high a rate as whites, and their rates of autism and certain childhood cancers are about 50% lower than among whites.13 Hispanics are in between in all respects. Breastfeeding mothers reduce their own body burdens of toxins by transmitting toxins to their babies in breast milk.14 This transmission of toxins takes place at the most vulnerable times of the rapidly-developing infants' lives. Certain researchers, seeing this excellent "decontaminating" of mothers by means of passing toxins on to their infants, still recommended breastfeeding "without any restrictions." 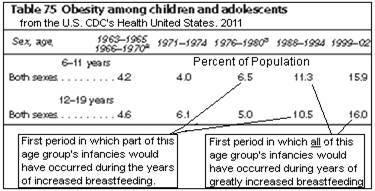 Remember that, between 1972 and 2010, breastfeeding rates increased greatly in the U.S. 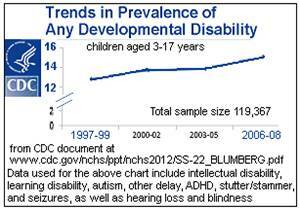 There are no surveys that show consistent child health data for that entire period, but there are separate studies for major segments of that period, which regularly show unfavorable trends among children (such as shown on the left). These adverse trends occurred despite huge declines during those years in child blood levels of the developmental toxin, lead,17 and despite major other pollution reductions. Immune cells in breast milk are often considered helpful to an infant, but that may be untrue over the long term in the current hygienic conditions in developed countries, which already have greatly reduced microbial exposure compared with what our species became adapted to. A prominent doctor, based on studies, refers to the “critical importance of proper immune conditioning by microbes during the earliest periods of life.” The FDA says epidemiological evidence supports that position.24 Quoting from the UCLA Food & Drug Allergy Center: "Overwhelming evidence from various studies suggests that the hygiene hypothesis explains most of the allergy epidemic." Bear in mind that long-term immunity (such as is created by vaccinations) is created by challenges that stimulate development of the immune system. Consider where short-lived immune cells from outside the body, destroying microbes, fit into the picture of microbial challenges needed to stimulate development of the immune system. Note that there are currently epidemics in childhood obesity, asthma, allergies and diabetes; and developmental disabilities (including autism and ADHD) have increased greatly; such increases apparently were unknown in the 1960's, when breastfeeding rates were low.25 Notice (above) that the increase of childhood diabetes was "striking" only where breastfeeding increased very sharply, and it declined only where breastfeeding declined. From pp.1 & 2, remember the many correlations of high and low rates of autism, cancer and obesity with highs and lows of breastfeeding. Bear in mind that U.S. breastfeeding rates increased several-fold between 1972 and the present;1 if that feeding had been genuinely beneficial (in our current low-microbial-exposure times), there should have been declines in children's disabilities, rather than the substantial increases that actually occurred. A logical question that comes up, then, is Should parents be unreservedly advised by medical authorities to breastfeed their infants, while the parents remain uninformed about the above important points? Further relevant information, with links to sources, can be found at www.breastfeeding-health-effects.info. - (7) U.S. EPA ”Estimating Exposure to Dioxin-Like Compounds” - Vol. I, U.S. EPA/600/8-88/005Ca., rev. 2005, for typical infant exposure, and EPA document at www.epa.gov/iris/supdocs/dioxinv1sup.pdf regarding safe dose. - (9) Breastfeeding rates from WHO, European HFA Database; autism data from many sources, cited in www.pollutionaction.org, third link, Sections 1.2.s.4-5; cancer rates from "International Comparisons of World Age-standardised Incidence Rates for Childhood Cancer: 1998-2000," Figure 4, from a website of Queens Univ., Belfast, Ireland, at http://www.qub.ac.uk/research-centres/nicr/FileStore/PDF/Filetoupload,176738,en.pdf ; also other sources. - (9a) for country-by-country data, see Section 1.2.p of http://www.pollutionaction.org/breastfeeding-and-autism-and-cancer.htm . - (10) Multiple sources, indicated in www.pollutionaction.org, second link, then Appendix 2.a in that paper. - (14) Decrease in milk and blood dioxin levels over two years in a mother nursing twins: estimates of decreased maternal and increased infant dioxin body burden from nursing. Schecter A et al, Department of Preventive Medicine, State University of New York, Health Science Center-Syracuse, USA Chemosphere. 1996 Feb;32(3):543-9. - (15) American J.of Epidemiology, Dec. 2008; 168(11): 1268–1276. Pub.online 2008 October 21. doi: 10.1093/aje/kwn250 "Advanced Parental Age and the Risk of Autism Spectrum Disorder" Maureen S. Durkin et al. - (16) U.K. source at www.doh.gov.uk; also "Factors Influencing Full Breastfeeding ..." Tammy J. Clifford, PhD, Human Lactation, 2012; also see footnote 11. - (19a) Diagnostic controversies in adult attention deficit hyperactivity disorder. McGough JJ, et al., Am J Psychiatry. 2004 Nov;161(11):1948-56. - (21) Developing World data from www.childinfo.org/breastfeeding_progress.htm. Other data from WHO/HFA datab. - (22) Incidence and trends of childhood Type 1 diabetes worldwide 1990-1999. DIAMOND Project Group. Diabet Med. 2006 Aug;23(8):857-66.